Lawrence Berkeley National Laboratory Environmental Energy Technology Division for four decades of leadership on energy efficiency R&D, helping to improve buildings technology and systems in extensive collaboration with industry and states. Massachusetts Energy Efficiency Advisory Council for facilitating rapid growth in the use of energy efficiency as a resource in Massachusetts, more than doubling the annual energy savings achieved. Sheldon Strom for founding the Center for Energy and the Environment and leading its many successful endeavors over 35 years including contributions to the Next Generation Energy Act and the very practical “Minnesota Way” for implementing energy efficiency programs and policies. The winners were nominated by their peers and selected by a committee of ACEEE’s board of directors from an impressive group of nominations. Selection criteria were based on each nominee’s impact, innovation, and leadership in the energy efficiency field. 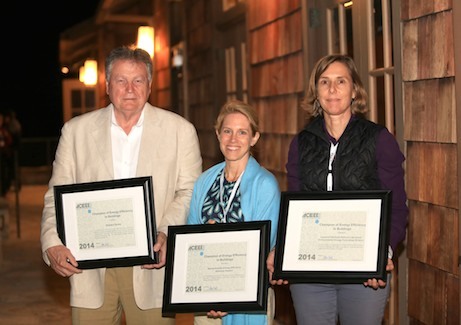 Learn more about the 2014 Champion of Energy Efficiency winners and stay connected with what’s happening at Summer Study by following @ACEEEdc and #ACEEE-SSB on Twitter and by visiting http://aceee.org to read the onsite newsletter, The Grapevine. Each day’s edition is available in the morning from August 18 through August 22, 2014.